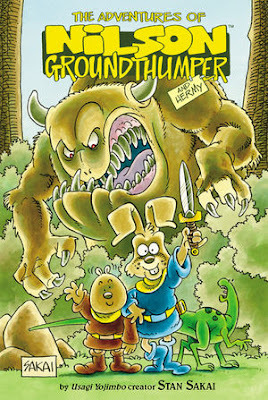 In a Medieval Europe populated by talking animals, two adventurers seek out quests--and narrowly avoid dying as they have to use their limited wits to keep out of trouble. 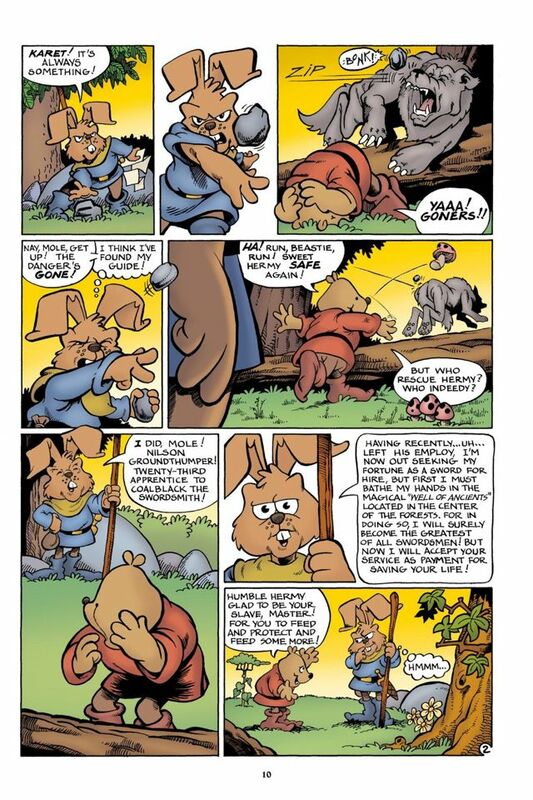 It's a very lighthearted take from the usually more serious Sakai, featuring all the things that lovers of Usagi Yojimbo adore about his epic series, and a look at what might have been. As noted above, Nilson and Hermy were planned for an epic, 2,500 page adventure (back before this was standard, too), but then Sakai did a story about Usagi, and the rest was "What if?" history. We'll never know if these two could achieve the lasting success of Usagi, who even made it into the Teenage Mutant Ninja Turtles, but these stories do show that Sakai was getting his feet wet in terms of his storytelling style. They're a ton of fun to read, reminding me a bit of Sergio Aragones and Mark Evanier's Groo, with a lot of humor involved in the action but without the political commentary. It's not quite Sakai's forte, though he does a good job balancing the action and jokes. Yet as the stories progress, it becomes more obvious that he's more interested in a warrior's journey than in putting together joke after joke. The stories themselves start in the early 80s and cut across Sakai's career, including a return to the characters in the second print version of Dark Horse Presents. That means that a careful reading eye can watch Sakai's style refine from the more open, cartoonish, loose work of the early years to the more carefully controlled linework of his modern stories. There's plenty of backgrounds to linger over, and just as with his Japan-themed Usagi, Nilson and Hermy inhabit a Medieval world that looks like it could step right into a history book. One of the more interesting things is that the art here not only features Nilson (a rabbit) and Hermy (a guinea pig), but humans as well, often as the foil. (They look a bit like Sergio's, by the way.) As you might expect, the art is top-notch, and some of the animals and other creatures you'll find lurking about will show up in Usagi's world as well--especially the tiny dinosaurs. Some historical comic collections are interesting onto to fans of the character or creator. That's not true here at all. The Adventures of Nilson Groundthumper and Hermy is a treat that anyone can enjoy. Being a fan of Sakai is just a great added bonus.